Aileen, you are amazing! I cannot believe how generous and helpful you are with your readers. I have read all your articles and I’ve seen tips on how we can get free accommodation but I was wondering, do you have a complete list somewhere so that I can do a complete research of all the options that I have? Even the cheaper options are fine! I’m going on a “round the world” (RTW) trip so it will be very helpful so I can save more money! Thank you and stay awesome! Like what Jen has mentioned in her message above, there are a LOT of cheap and free accommodation options out there that can help you save money as you travel the world! A lot of people look at travel as an expensive activity that can only enjoyed by the rich, but such is not true! Travel can be reaaaally affordable — in fact, it will only become expensive if you choose it so (e.g. booking yourself into 5-star hotels, etc, etc). So indeed, for as long as you are open and proactively seeking available choices which will give you cheap or free places to sleep in, you can always save a whole lot on your travel fund. 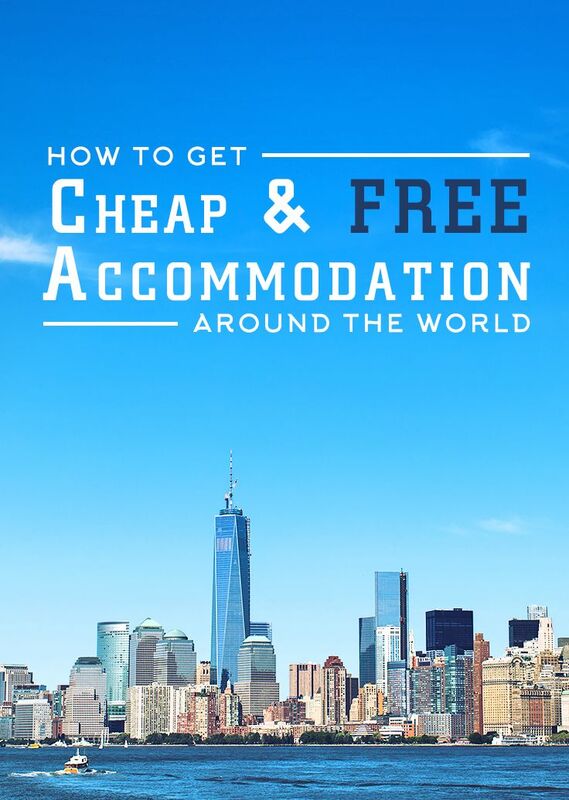 And to save you from the trouble of listing all the best resources on cheap or free accommodation, I have come up with this comprehensive article! Please feel free to share it with your friends or bookmark it to your browser for future reference! Couch surfing is a ‘coined term’ that refers to the act of permitting a friend or stranger to stay in your house for FREE, and they can use whatever space available that you allow them to occupy: the couch, the floor, or a whole room. Through this way, a host can enjoy meeting new/foreign people, while the ‘couch surfer’ can of course enjoy the free accommodation and the chance to experience the city with a local (the host). Simply put, in these websites you can either be a host or a couch surfer and it’s absolutely free to connect with anyone in the world that’s open to doing a couch surfing set-up. TIP: Make full use of a couch surfing website’s ‘testimonial’ system which will help give you an overview on what kind of host or traveler you will be dealing with as per the reviews or references left on their profile. What’s more is that couch surfing platforms typically have a verification system which will help ensure more transparency and trust between members; therefore, it’s best to look for hosts that are ‘verified’. The biggest and most popular platform today that connects hosts to travelers around the world! Run by volunteers, it has a big community mostly from European countries. It looks like a website that’s stuck in the 90s, but don’t let its looks fool you. It is a very established site and has an engaged community even up to today. There are other websites that you can check like www.GlobalFreeLoaders.com and www.Servas.org that have been up and running for years, but going by feedback, it seems that the community isn’t that active anymore. (But I guess, it’s still worth a shot especially if you can’t find anything from the 3 websites above). House sitting is the practice wherein a homeowner entrusts his/her home to an individual (referred to as a house sitter). Under a mutual agreement, the house sitter can stay in the house for free but in return, he/she is expected to watch after the house (as well as the homeowner’s pets if available). Other responsibilities may come along with it too as per the specification of a homeowner (like tending the garden, etc). TIP: Be careful to scrutinize all the details and clear out the expectations between you and the homeowner since, for instance, some of them might want you to cover the cost of utilities during your stay. Also, house sitting websites often come with an annual membership fee. Rest assured, they are relatively cheap! And besides, you will only have to pay if you want to get in touch with the homeowners so it’s absolutely FREE to browse the website to search for properties first before you purchase the membership to contact your prospects. The biggest house sitting website of all and my personal favorite! Most of the listings here require you to look after a pet (or pets), so if you’re an animal lover, this is the best set-up for you! (If you’re looking for a long-term house sitting stint, they also have a special section for that). » Membership Fee: $95.88 (Php 4,200+) per year | Use code AILEEN upon checkout to save 10% off across all membership plans! It’s a relatively new website but it already has a decent amount of listings. Plus, the interface is very appealing and user-friendly so it’s a sure eye-candy! Listings on this website are primarily for the USA and Australia, but there are also listings available for other locations around the world. It’s another one of those websites that looks hideous, but there’s a reason why this is still up and running today. It has a lot of listings and the community is still active. Most of the listings are located in UK and Europe and this is a relatively new website that is popular among the English people. It aims to list houses that are in a way more ‘luxurious’; still and the same, most of the listings are typical houses that you would normally find in other housesitting websites. (But there are occasional hidden gems here and there). It doesn’t have as many listings as let’s say, TrustedHouseSitters.com, but it has a very cheap annual fee so it’s quite a steal! Other websites that you can check are www.SabbaticalHomes.com (geared for academic tenants), www.HomeSit.co.nz (homesits in New Zealand), www.EasyHouseSitting.com (homesits in Australia) and more — if you are specifically looking for home sits in a certain place, simply type your search on Google and you’re bound to land on a relevant site. Nevertheless, I highly suggest that you try first the top house sitting websites above since they are already regarded as trusted platforms. Home exchanges or home swapping is exactly what you think it is. For a specific period of time, you will swap houses with someone from another country — you will live in their home and he/she will live in yours and technically, it’s a great set-up if you’re someone who owns a home and looking to get a free accommodation (a whole house) in someplace else, anywhere in the world. (This concept was best portrayed in the 2006 movie, The Holiday). Anyhow, there are some home exchange websites that do not have mutual exchanges, meaning that you don’t have to swap houses with someone at the same time frame (e.g. Trampolinn, etc.). NOTE: Some homeowners find this as a bit of a nerve-wracking arrangement (much like house sitting) but you (as a homeowner) shouldn’t be afraid at all since all home exchange websites put great value in building trust among its members. Besides, you should also remember that the other homeowner is also entrusting their home to you! Now, much like house sitting websites, most home exchange websites have a membership fee but you are free to browse the listings first before deciding on a membership plan that will allow you to connect with other home swappers. A non-mutual home exchange. So you can simply ‘rent’ a space of any member’s house and for you to ‘rent’ it, you’ll just use the site’s virtual points which are easy to gain by inviting friends, hosting someone, etc. (To know more info, see my review here). Said to be the world’s largest home exchange club. One of the good things about them is that they have a point system wherein you’ll gain points by hosting. You can then use these to “buy” a stay at another place (without doing a home swap). One of the largest home exchange websites in the world. Personally, I like how there’s a map overview of all the listings available on the website. It is not only one of the biggest home swap platforms but it is also the first home swap network in the world. Given their long-running experience, they have already established a lot of multilingual representatives around the world. Established in 1985, most of its listings that are available for home swaps are located in the UK, but they have a decent amount in other countries too, of course. Specializes in family home swaps! It even has helpful family guides to assist you during your stay in another location. Most properties are found in USA. Check out www.GuestToGuest.com and www.MyTwinPlace.com too! For academics, a website worth looking into is www.SabbaticalHomes.com which has a free membership fee for academics and $20 fee for non-academics for every 14 months. Another website is www.WarmShowers.org which is a community of touring (bicycle) cyclists and willing hosts that are open to a hospitality exchange. Volunteering (also called as a work exchange) is an act wherein by doing menial work for an establishment, they will give you free accommodation and/or food in return. There are volunteering opportunities in a lot of big charity groups like WWF but those have expensive registration fees; so what I will be enumerating below are simply job listing websites where bars, fruit farms, hotels, hostels, restaurants, schools, etc. are looking for travelers like you to work for them part-time. Some of these websites are free while others have membership fees — however, you are always free to browse through the job listings first before purchasing a membership fee to contact the employers. NOTE: Working in exchange for free food and bed is generally a gray area for most countries (it’s neither legal nor illegal; it’s generally tolerated since governments don’t really care if you managed to stay for free by doing a bit of non-paid work for a hostel or hotel for example). However, when you start to work for an establishment that pays you in cash, be reminded that this is the kind of exchange wherein you need a proper work permit — NEVER do work and take in cash if you don’t have a work permit or visa. (You can get these work permits yourself, though sometimes, your ’employer’ could be generous enough to support you in getting one). Still, most establishments continue to freely offer paid jobs ‘under the table’ even if you don’t have a work permit. (They know that it’s illegal that’s why some of these sites even put up a tip saying that you shouldn’t mention that you’re going to do volunteer work when going through immigration). Lists free and cheap accommodation offered by various individuals, farms, hostels, and more! Updated daily. There’s no need for registration here as you are free to search their huge database of job opportunities that are paid and non-paid. Includes a lot of opportunities worldwide encompassing projects, language teaching, community work and a whole lot more! Simply a resource website that shows opportunities worldwide. (It’s a mix of free and paid volunteer opportunities). A website that links you to organic farms and smallholdings looking for volunteer help. On average, you are expected to help for 4-6 hours a day in exchange for food and accommodation. (There are WWOOF headquarters worldwide and you have to register to the country that corresponds to your destination). A good website for volunteer helpers. On average, you would work an average of 4 hours per day and receive free accommodation and meals in return. This is the most popular platform today for volunteer helpers; in fact, it is the website that a lot of my traveler friends use when looking for volunteering opportunities! Come check it out! Lists all free and low-cost volunteer programs throughout Central and South America. If you’re looking for a list of volunteer opportunities in a farm or winery, PickingJobs is the platform that you should go to! A very engaging forum that is regularly updated with hostel/resort/hotel jobs . Apart from that, there’s also information about teaching English abroad and more. A more user-friendly interface for hostel job opportunities. There’s a membership fee involved but I suggest that since the listings are free to browse through, just get the details of the hostel and then contact them directly through their website by searching for them through Google. (Other websites to check: www.WorkingCouples.com that shows job opportunities fit for traveling couples). If in case you want to see volunteering opportunities for charities (that are often more expensive), you can always check the following websites: www.GoAbroad.com/volunteer-abroad or www.GlobalHelpSwap.com/volunteering. The leading booking platform in the world for hostels! One of the good things about them is that they have taken away booking fees across all of their listed hostels. Another big hostel booking platform. I highly suggest that you use this alongside Hostel World when searching for your accommodation so that you can compare and grab the best deal. Most of the time though, I would see cheaper deals on HostelWorld. My favorite booking platforms of ALL time whenever I’m looking for cheap hotels and best hotel deals all over the world! Agoda for Asia, Booking.com for Europe, and HotelsCombined for the rest — they beat everything else when it comes to prices so I suggest that you reap the benefits on this one! I just discovered this website recently and it’s ridiculously good! The basic idea is that whenever someone can’t fulfill their prepaid hotel room, you can grab their reservation at a lower price (up to 70% off). Needless to say, you definitely should check this out! Short-term rentals — it’s exactly what it means, for it saves you from the hassle and cost of typical rentals that commonly want you to commit long-term (years). Therefore when you’re looking into staying at one place for a longer period of time (which couchsurfing or home exchanges won’t usually offer), the websites below will not only give you more flexibility but also a cheaper alternative. I bet you’ve heard of AirBnB at one point or another and for sure, it’s a great website that can give you affordable and unique rental spaces across the globe (from rooms, apartments, to whole houses, etc). Give it a try! And if you sign up through my link, you’ll get free $25 credit as a welcome gift. Enjoy! TripAdvisor is NOT only a website for hotel bookings and reviews, but it’s also a platform that has rental listings! I’ve used them previously and they have some options that I didn’t see on AirBnB so it’s wise to check here too. Another one of the big short-term rental booking platforms online. (Majority of the listings are apartments). Said to be the biggest portal in Europe for apartment rentals, Wimdu is also a great resource for listings across the globe. In case you still haven’t found any good short term rental options in the four big rental websites above, Roomarama is another platform that you can explore. This website focuses on featuring home vacation rentals around the world for short to medium term renting. (If in case you’ve heard of VRBO, it’s one of the booking platforms under this HomeAway family). Also one of the largest websites in the world that focuses on house/home vacation rentals, feel free to scan through their listings in case you haven’t found a good one yet in other platforms like HomeAway, etc. As the name goes, it specializes in apartment rentals only for short and medium stays and it surely has a wide selection of listings! It operates much like Only-Apartments (given how it showcases apartments only) but to make it more ‘niched’, it concentrates on the highest-quality property listings in Europe only! Home stay (or homestay) is where local families permit you, as a traveler / tourist, to stay in their home and rent one of their vacant rooms. It’s a great way to immerse yourself to the local lifestyle of a country abroad and it’s hugely supported by the tourism industry. This is one of the largest homestay platforms and my personal favorite! Present in over 140 countries, it’s the perfect place to connect with homes who are open to travelers like you. For other home stay websites, feel free to look into www.WorldwideHomestay.com or www.HomestayFinder.com. They are two of the older home stay websites out there that are still up and running today, but less appealing to the eye and less user-friendly. Contrary to WWOOF (which I’ve mentioned above under the ‘Volunteering’ category), farm stays (also called as agriturismos) will allow you to live in a farm WITHOUT the labor and in exchange for a small fee. You can still be involved in the ‘farm life’ though, and it’s up to you to arrange that with the farm owners so that you can get to experience typical activities that are often done in their place. #44 – Farm Stay U.S. Formed by the U.S. Farm Stay Association, this website aims to connects guests with farm and ranch stays throughout the United States. As the name goes, it provides you with the list of farm stays on the whole of UK and it is closely run by a local group of Board of Directors. NOTE: Available farm stays worldwide can also be found on websites that I have listed under the ‘Short-Term Rental’ category. Simply filter your search results and you’re bound to see several listings. Living in a boat can be categorized under ‘volunteering’ since you are often required to give help as a part of the boat owner’s crew. However, I’ve decided to put this in a separate category as it somehow ‘different’; besides, by living in a boat, you do not only save accommodation costs but also transportation costs! NOTE: Depending on the boat owner, in return for your work, you can be compensated, given free food + accommodation, or be granted both benefits. Sometimes, some would ask you to share expenses throughout the trip. All in all, it’s best to iron out the details first so you know what to expect. Probably the biggest platform out there for sailors! In this forum, there’s a special section where sailors would often post ‘classifieds’ whenever they are looking for amateur or professional crew members. [ http://www.sailingpoint.com/cc.shtml ] Though the website looks very old-fashioned, it’s a very helpful resource! The community is very active and there are always boat owners who are actively seeking for crew members. (If in case you don’t see any available postings for your preferred route, you can always put up a post to attract the attention of a boat owner). Unlike the previous two sailing websites above, Find a Crew is not a forum but more of a website that has a user-friendly interface that allows you to thoroughly search all boat stay opportunities on the site. Other websites to look into: www.CrewBay.com, www.CrewSeekers.net, or www.FloatPlan.com. If you want to stay in a foreign country for at least 6 months, au pair is something that you can totally do! A popular practice among young ones in Europe, ‘au pair’ is a nanny job wherein you would also be expected to do some light housework. Apart from receiving free accommodation and food, the family that is interested in hiring you will also give you an allowance. Camping ‘as is’ – apart from camping in a free space of a country’s natural landscape (make sure that it’s legal to do so), you can also do camping by booking yourself into commercial camping grounds that are very cheap (which can be as low as $10 or Php 400+ per night). Not an ideal arrangement, but surely, one of the usual ways to save money on accommodation is to travel to your destination at night by riding overnight buses, trains, planes, boats, etc. Some people would even sleep at the terminal — this is not also ideal and it’s a bit risky too, but it’s certainly one of the ways to save on accommodation costs. As for your another form of transportation, surely if you are going on a road trip and planning on bringing your car, sleeping in your vehicle is another option. (There are even certain establishments worldwide that can permit you to park your car in their rest stops in order to stay overnight). Actually, at the very start, this is one of the things that you should do in order to score free accommodation during your travels. So go ahead and get in touch with old friends and family members to ask if they would be able to take you in for X number of days. BONUS – Do Travel Blogging! » READ: How to Start a Travel Blog from Scratch: Your Ultimate Guide! With over 52 options (and a bonus step) for you to choose from, it should be perfectly clear by now that it is absolutely possible for you to get cheap and free accommodation in any part of the globe — you really don’t need to spend tons of money to fulfill your travel dreams! In a way, I guess most of these choices require a certain degree of openness since most of the experiences (like CouchSurfing) might be a new concept for you. Nevertheless, there’s no need to fear. As a start, you can always ‘test the waters’ by doing it in your home country first, in this way you can throw away your inhibitions bit by bit. Overall, I dearly hope that this helps you. Safe travels! DISCLAIMER: Some links are referral links. This means that I will get a bonus at NO cost to you when you sign up; in fact, signing up through my links will make you get extra points/money on the site. So, enjoy! But of course, like always, I only set up referral links for brands that I personally recommend. Have you tried some of the websites that I’ve mentioned above? What were they and how was your experience with them? Do you have anything to add to this list? Please feel free to leave a comment below in case you have any other suggestions. Thank you! I would like to add another one: www.mytwinplace.com . We've been using many home exchange web sites las 10 years and no doubt www.mytwinplace.com is the most flexible one we've ever used. The have a great concept of travel credit and you only pay $10 when you find your free accommodation..... till this point totally unlimmited and free. Simply perfect for us! Thank you for your recommendation. I'll definitely check it out and include it on the list for others to review. Cheers! You're welcome, Giulia! Here's to hoping that you get to use them to have more travels! You're welcome :) Glad you like it! Bookmarking this post for future reference. You put everything i've been searching for on cheap travel in one post! So many great ideas for cheap accommodation!! Wow! What a resource! I have used a few of these with great success but will definitely be checking out these other options for our next trip. Great stuff, girl! Glad you like it Chelsea! ❤️ It's always great to have LOTS of travel options! Thank you for compiling this. And I'm glad I found your blog! You're welcome, Kristel! And I'm glad that you found my blog too ;) Hope this helps you! As always, all your blog posts are so helpful to me as an aspiring blogger. You're so approachable :)) Wish I could meet you someday Miss Aileen. Massive thanks for motivating us and inspiring.